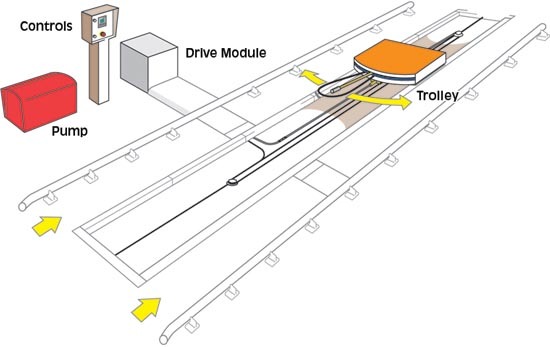 Installation of the Chassijet system is quick and simple with the trolley rails bolted direct to the floor, suspended over an existing inspection pit, or fitted to a specially constructed ramp. Various options are available to suit both customer and site requirements, optional systems include: hot water module, detergent injection, pre-wash foam application, pressure reduction, frost protection, manual hand lance, and water reclamation. Operation of the Chassijet is extremely simple. The operator places the vehicle on the wash pad, selects the program number, and pushes the start key. The entire cleaning is then carried out automatically with the cleaning trolley moving along the track while the spray nozzle oscilates and sweeps from side to side.